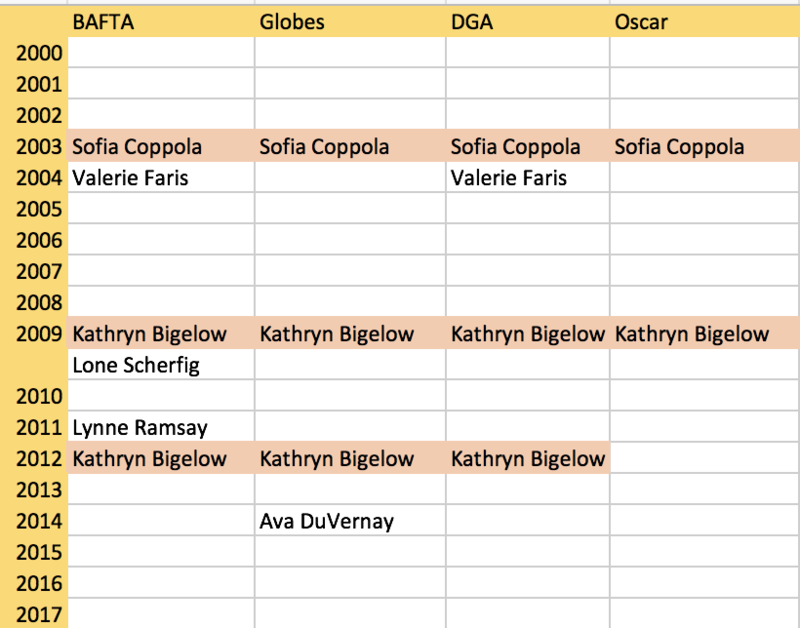 There is some hubbub in the news about female directors and the BAFTA, but a quick scan of their history shows that they have a pretty good track record, comparatively speaking, much better than the Globes, the DGA or Oscar. Where they are really lacking is in African American or black directors. Only Steve McQueen has ever been nominated there, not Barry Jenkins, not Jordan Peele. What’s happening is that the film critics and the industry seem to be pushing Lady Bird and Greta Gerwig pretty hard, as in “the greatest film ever reviewed on Rotten Tomatoes.” If it gets great reviews, makes money at the box office, is beloved widely by so many how can it be ignored? It’s hard to argue with that rationale. Whether you think its ambitious enough or not, whether it’s your favorite film of the year, or even your favorite directed by a woman, the fact remains that it is indeed one of this year’s biggest success stories. Still, just because we are all trying to fix our broken system here by forcing change, that doesn’t mean necessarily that Lady Bird is better directed than Shape of Water or Three Billboards or Dunkirk or even Blade Runner 2049. I would have a tough time myself making that call unless I thought about it terms of power and opportunity. Women just don’t yet have the same opportunities as men in terms of what kinds of stories they’re allowed to tell. Even something as non-threatening as Lady Bird, about a messed up teenage girl in Sacramento, has a hard time breaking into the boys club. 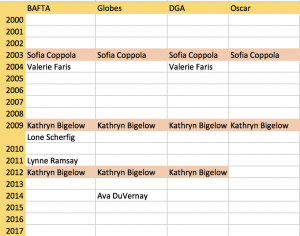 But BAFTA has nominated 6 women since 2000, where the Globes and DGA have nominated 4, and the Academy lacks woefully behind with just 2.